This recipe is adapted from something I saw in Cooking Light Magazine (March 2011). Winter is STILL alive and well in Nashville, but I’m growing tired of heavy cold-weather soups. So I was searching for something light and healthy but substantial enough for a main course. With 4-5 modifications (though still keeping the health benefits in tact) I came up with a very satisfying meal. Enjoy! 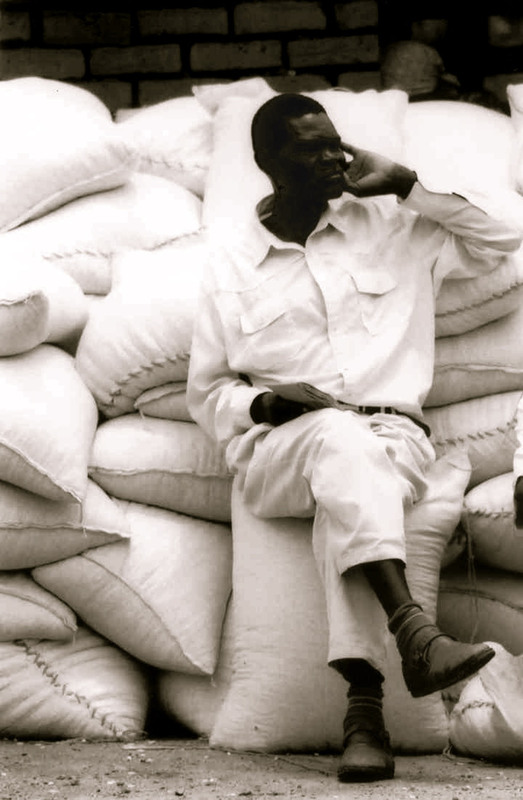 Start by getting your Mise en Place together. This is crucial because once the meat is browned, everything moves quickly. Dice your onion (you’ll probably use 1/2 of a medium onion). Julienne your fennel. Be sure to peel off the outer layer which can be pretty tough and bitter. Mince garlic fine if not using pre-minced from a jar. After rinsing your kale, fold leaves lengthwise so that the spine shows. Pull away from spine and tear leaves into one inch pieces. Discard spines. Rinse and drain your canned beans. Okay – everything in place? Start by browning the sausage. Peel casings off sausage links and break into one inch pieces while stirring and browning. If you have an enamel cast iron pot, you can do this all in one vessel. But if not, use a frying pan or a pan that browns meat well. Turkey sausage doesn’t render a lot of fat so you may need to give it a splash of olive oil while browning. Once meat is browned and almost thoroughly cooked, add olive oil, onion, garlic and fennel and saute until tender, probably 5-7 minutes on medium heat. Once the veggies are tender, add the chicken and garlic vegetables broths. [By the way, you can make this with just chicken broth, but I promise you – it won’t taste as amazing.] Add the beans, cover and bring to a boil, stirring occasionally. About 5 minutes. Then add the kale and simmer for another 5 minutes, or until the kale wilts. Sprinkle the Parmesan shavings on top right before serving. Tip: I pre-shaved extra Parm and have it ready for leftover soup! Now this is one of my favorite “perfect bite” moments… when you can load your spoon with a little bit of everything. 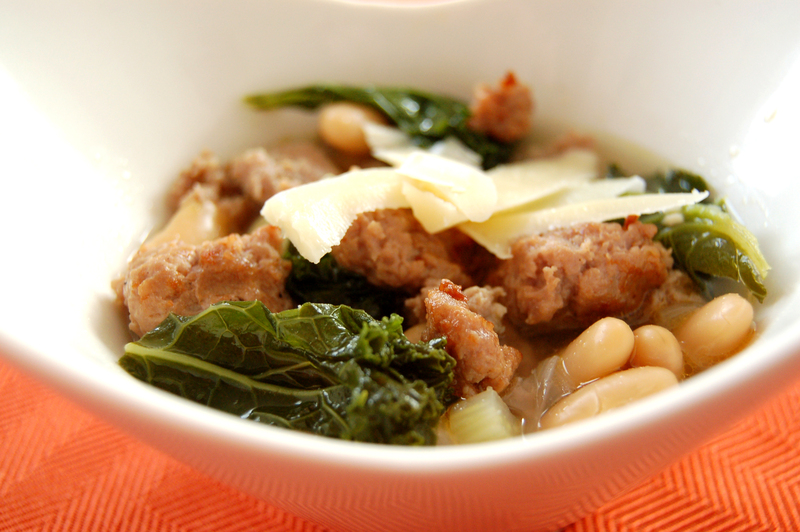 Seriously, scoop up a chunky piece of sausage, a couple of white beans, some leafy kale and some garlicky broth. And be sure to get some Parmesan on there! It’s like they were created to go together. You will hear poetry in your head. Pairing wines with soup recipes can be tricky. If you breakdown your soup ingredients and view them as you would a pasta sauce or something of similar status then your task will be less intimidating. If your soup is a tomato base then you’d want a wine with a little less acidity and lighter on the tannin content. If your soup (or stew or chili) is heavy on beans or meat then you could also get away with a wine that has a bit more body and strength. Which is why I chose a 2007 Malbec from Pannotia Vineyards for this soup. 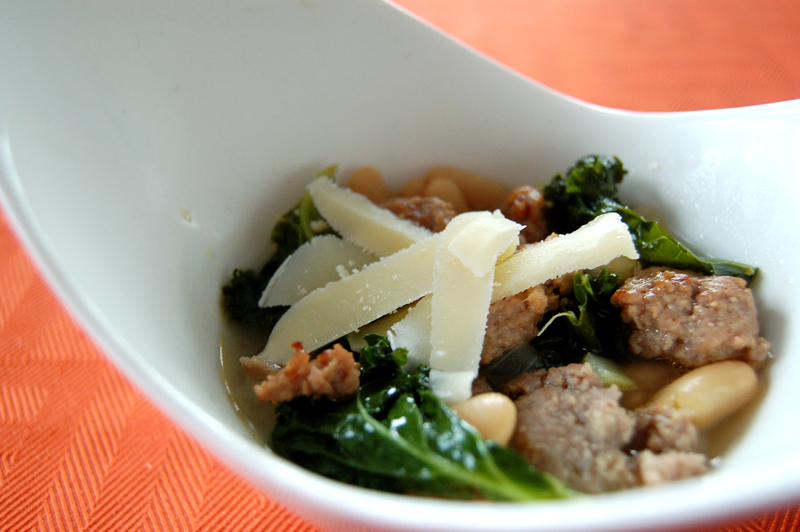 With a hint of clove and cinnamon and full tannins, it will play nicely off the sweetness Italian sausage and hold up against the slightly bitter kale. 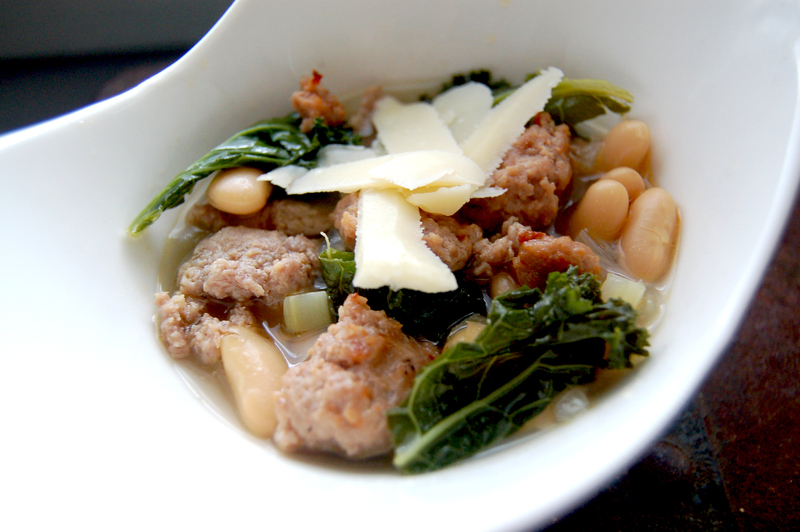 Thanks to Cooking Light Magazine who provided all the health specs for this soup.